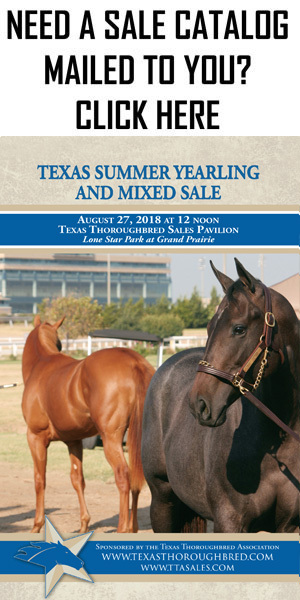 TTA Sales and Lone Star Park are pleased to announce a pre-sale brunch prior to the Texas 2-Year-Olds in Training Sale at Lone Star Park. The sale is set for Wednesday, April 10 at 12 noon, and the pre-sale brunch will be held in the sales pavilion that morning from 9 a.m. to 11 a.m. Complimentary Bloody Marys and mimosas will be available along with water, coffee and tea. Also complimentary food including breakfast burritos, fresh fruit with honey yogurt dip, yogurt cups, danishes and pastries will be available along with other food for purchase. The pre-sale brunch is open to all horsemen, consignors and buyers.